Hartford Old state house is listed as a haunted site on the web’s haunted place index. Can the witch trials that took place in artford between 1647-1698 be why? Before the State House was built it was used as an exaction spot for people charged with crimes punishable by death. 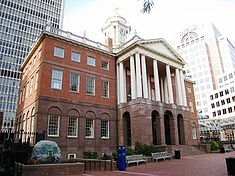 Located at 800 Main St. in Hartford, CT the old state house was built in 1796 by American Architect Charles Bulfinch as his first public building, it was meant to resemble the town hall in Liverpool England. It first story is 20 feet high built with Portland Connecticut brownstone. Its balustrade was added in the early 1800’s, its bell tower and John Stanwood’s statue added in 1827. The Hartford convention of 1814 was held here. State and City officials recently signed a 99 year lease placing Hartford’s old statehouse under the management of the state office of Legislative Management.